Made in extremely robust, heavy duty cowhide. Composite rubber lined gusset in interior. 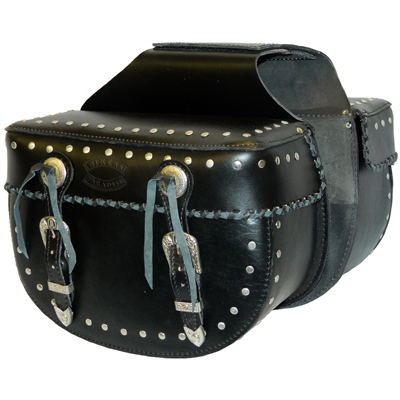 Fitted lid with two buckle fastening. Plaiting detail around the base of the lid. Studded design around the lid and main body seams. Two poncho designs on lid fastenings. Strong Velcro fixing panel. Leather thong ties at the back of each pannier for extra security.